The hotel boasts nine fully-equipped meeting rooms which can accommodate up to 120 guests. Weddings and other special events will be enhanced by beautiful lake views at this hotel. Guests can choose from classic, privilege and superior rooms. The Brasserie serves internationally inspired cuisine in a modern, comfortable setting; guests will enjoy their meal even more with the stunning views of the surrounding area that the restaurant offers. Drinks are served daily in The Bar. 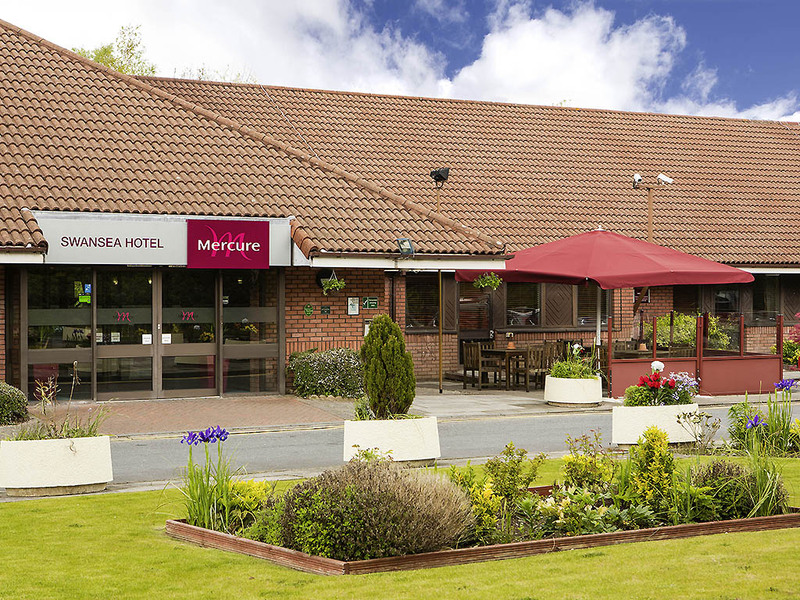 Three miles from Swansea city centre, the Mercure Swansea hotel is set in landscaped grounds. The beaches of the Gower Peninsula are just nine miles away. All bedrooms feature a flat-screen TV and complimentary high speed WiFi. In privilege and superior rooms you'll enjoy a Nespresso coffee machine, newspaper, robe and slippers. Soak up the atmosphere in our restaurant and enjoy inspiring views over the surrounding area. Choose from a diverse collection of mouthwatering dishes prepared using fresh and local produce. Don't forget to try one of our delicious desserts too. After walking in the Welsh hills, tuck into scones and clotted cream for afternoon tea. Sip a Welsh whisky by the fire in the bar, or take to your rooms and order from our 24 hour menu. We received a very warm welcome and were given clear directions to our room. There was no lift, but that wasn't a problem for us. Corridor floor very creaky but we couldn't hear it from inside our room. Although the bedroom was comfortable and well-furnished the bathroom was a little dated (but the shower was great). A meal in the bar was very tasty but a shame there were no local beers available on draught. Most of the &quot;comfy&quot; seats in bar area have seats that are so deep you can't sit comfortably. Check in process was efficient and friendly, room was lovely, food was distinctly average. I ordered chunky chips from the menu and received thin frozen chips - not something I'd expect to pay £3.80 for. I also ordered a cheese board which cost £9 and it came with 3 crackers!! As a vegetarian - the breakfast was extremely poor. Only one choice of egg - rubbery, tasteless fried. Veggie sausages were cooked from frozen so I didn't have time to wait for them. No hash browns. So £15 for a rubbery egg, mushrooms, beans and tomatoes. Friendly staff and lovely clean and comfortable rooms. We liked the use of the swimming pool and whee the hotel was situated. It was nice because all staff were lovely and friendly and you felt welcome. Service was excellent as always, from the receprtionist to the breakfast staff. Nice room although windows need replacing as could not see out. Excellent free car parking and nice breakfast. Dog charge too high at £15 per night when nothing provided for pet. Bath room requires some tiles bybtoklet repairing but great hot water. Nice quiet location. A comfortable stay with no frills. The hotel decor, food and rooms are of a good standard, instilling a calm and warming feeling that allows you to instantly begin to unwind ready for a pretty decent nights sleep in a comfortable bed. However the only down side to this hotel, the facilities leave a lot to the imagination. They’re small, unwelcoming, low standard and overall, pointless waste of space. And to think, there’s a “g.” membership available... to be honest you might as well take a dip in your bath tub, carry out some sit ups and press ups in your room and go for a run in the real world. Short business trip with 1 night stay. Service was good as usual. Just used bar and restaurant no complaints. Well organised staff on check in. Rooms were clean and comfortable. I had booked a room for my over night stay and conferencing room, many months in advance all together i had booked 5 separate dates in total. When i arrived on this occasion my reservation was not on the booking register. On the day of the conference tea and coffee were arranged for 08:30, 10:00, 12:00 and 14:00. No Tea or coffee was put out for the 08:30 arrival of guests i had to ask for it and then made to feel rather uncomfortable by the Y. man there making me feel as though i had made the mistake. to which he replied to one of the waitresses &quot;yeah he is right&quot;. The 10:00 coffee never arrived and i had to again go and ask for it this time i was told by the waitress &quot;i thought someone told me you wanted the tea and coffee at 11:30 or 12:00 of something like that&quot;. I cancelled the 12:00 and 14:00 tea and coffee. Convenient accommodation whilst visiting family and going to the international in Cardiff. The room was clean and comfortable and the restaurant met our needs. I have stayed at this hotel on numerous occasions over the past few years. I have Learnt that if I want to get a good room I book a privelage room as they are a good size. The rooms are looking a bit worn now and could do with a makeover. The food is always of good quality in the restraint and bar. Breakfast has plenty of choice but it would be nice to have more choice of fruit and yoghurts. The gym is tiny and it would be lovely if this was to be extended at some point. Overall, a decent hotel not too far out of Swansea and located not too far from the M4 motorway. On this stay, problems with the room were disappointing. I've stayed at this hotel many times and always rated it highly, but this time numerous problems with the room were disappointing. The toilet seat was loose and badly fitted, making using the toilet precarious because it slid around, the seat wouldn't stay up and the lid fell down when sitting on it. I reported it straight away, but it wasn't looked at until I shortly checked out after a three night stay. Also things like tissues, towels and tea/coffee were not fully replenished leaving me running out of clean towels on my last day. The TV also didn't have BBC 2 available. I could go on! I had a wonderful relaxing stay on Sunday evening. Excellent staff, polite, efficient. Delicious meals. Comfortable bar area and bedroom. 2 great swims and a good night's sleep. Thanks. I'll be back!